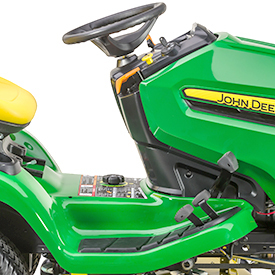 The tractor is powered by a John Deere iTorque™ power system, a combination of engine features and an exclusive hood design that provides superior lugging ability, even cooling, and durability. Fuel tank has a large, 3.3-U.S. gal. (12.5-L) capacity for more hours of operation between refills. Large, 3-in. 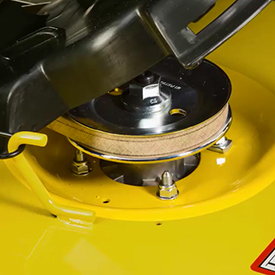 (7.6-cm) diameter fuel tank filler opening makes adding fuel easy. 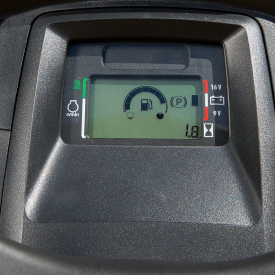 Electronic fuel gauge on the dash display allows the operator to easily monitor the amount of fuel in the tank. 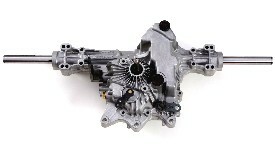 Cast-iron front axle is strong and shock-resistant. Cast iron will not yield under heavy loads or impact. The bushing provides excellent wear resistance. Grease fittings at each spindle are easy to service. 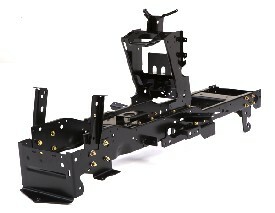 Includes strong frame mounts with a combination of mounting holes in the tractor hitch plate that accept pins or shoulder bolts to support heavy rear-mounted equipment. Optional lever-action or electric one-touch MulchControl attachment provides superior mulching performance and versatility. The 48A Power Flow blower has an inlet housing with over 50 percent greater area than the 48X Power Flow blower used on previous machines. The 48A has a 23 percent heavier overall weight than the Edge™ Xtra 48-in. 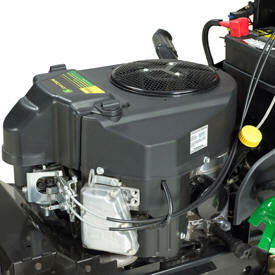 (122-cm) mower deck used on previous machines. Setting wheels to the correct height for the cutting height quick and easy. 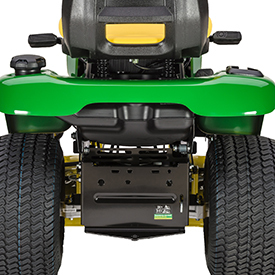 Low-tension belt-drive design reduces the side load on engine lower bearings and mower deck bearings for longer life. 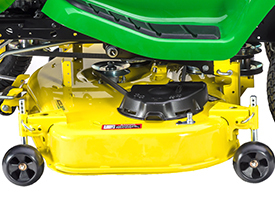 The 48A Mower Deck features a 5/8-in. (16-mm) diameter solid-steel rod side bumper that provides extra strength and protection. With an optional MulchControl attachment installed (along with the special mulching blades), changing from side-discharging to mulching or vice versa is done with the simple flip of a lever or push of an electric switch. The Power Flow rear bagger can be used with the MulchControl attachment and blades installed by simply using the MulchControl lever or electric one-touch switch to move the mulch baffle to the side-discharge position. The MulchControl baffle, or divider, between the left and middle spindles is about half way down. The height is designed to balance the mulching and side-discharge modes. When the MulchControl baffle is open, the divider between the left and middle spindles passes a portion of the material to the discharge opening, along with the material from the middle and right spindle areas. 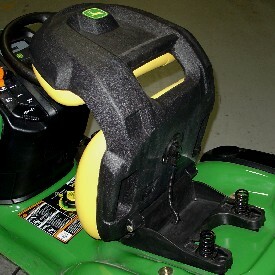 For the lever-action MulchControl attachment, a handle on top of the mower deck is used to engage or disengage mulch mode. 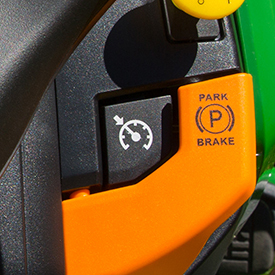 The operator is required to get off of the tractor in order to engage or disengage mulch mode with the lever-action system. 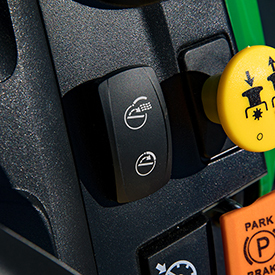 For the electric one-touch MulchControl attachment, a switch on the tractor dash is used to engage or disengage mulch mode. Changing from mulch mode to side discharge mode or vice versa takes only a few seconds. MulchControl puts the operator in control of the clippings. The operator can have all the benefits of mulching with the ability to easily change to side discharging or bagging when needed. The Power Flow blower and chute are easy to install. The Power Flow blower swings out for easy cleanout and cleanup. Larger 14-bu (493-L) and 19-bu (670-L) MCS are available, in addition to the 7-bu (247-L) MCS, for specific X300 and X500 Series Tractor models. 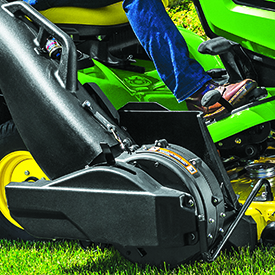 Lever-action or electric one-touch MulchControl attachment is available for Accel Deep™ 42-in. (107-cm) (42A), 48-in. (122-cm) (48A), and 54-in. 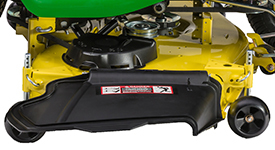 (137-cm) (54A) Mower Decks used on X300 and X500 Select Series™ Tractors. In mulch mode, it controls clippings dispersion in unwanted areas (driveways, landscape beds, near buildings, windows, parking lots, etc.). Reduces cleanup time needed to dispose of clippings. 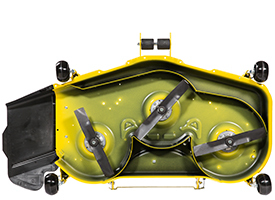 Reduces the amount of material entering a material collection system because, even in the side discharge mode, MulchControl will mulch about one third of the material due to the additional baffles under the mower deck and the unique design of the mulching blades. 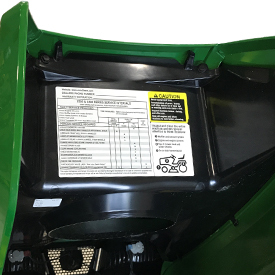 Electric MulchControl has the additional advantage of being controlled from the tractor seat by a switch on the dash to operate an electric actuator that moves the baffle to close off the discharge area of the mower deck. 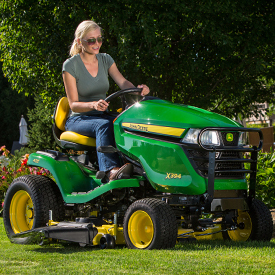 Operators can convert between modes without interrupting the mowing process, making it practical to change between modes as conditions require. 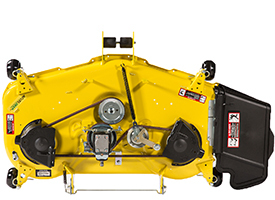 Models equipped with a 42A Mower Deck require a MulchControl baffle be removed to install the bagger chute; see 42A Mower Deck versatility explanation for more information. Changing from one mode to the other takes only a few seconds. 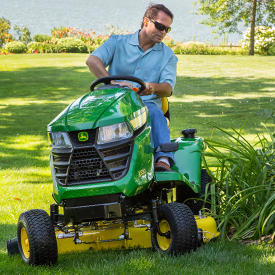 A mower equipped with a MulchControl attachment delivers unprecedented levels of productivity and versatility. The operator has the ability to quickly change between side discharging and mulching. 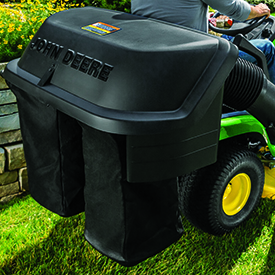 A heavy-duty baffle opens and closes to convert the mower from side discharge mode to mulch mode or vice versa. When the MulchControl baffle is open, most of the material flows freely out the discharge deflector or into a material collection system. When the MulchControl baffle is closed, material stays within the deck and gets chopped into mulch and deposited in the turf. MulchControl puts the operator in control of the clippings. The operator can have all the benefits of mulching with the ability to easily change to side discharging when desired. Mulching is beneficial because it returns the clippings to the ground as fertilizer, which promotes lawn growth. Clippings are much smaller, which allows them to fall into the grass and be removed from view. Unsightly grass clippings are not blown onto driveways or into flower beds. Fertilizer use is reduced and provides associated environmental benefits. Operators can convert quickly between modes, making it possible to change between mulching and side discharging as conditions require. Mulching heavy, thick material can significantly reduce mower productivity. The ability to switch from mulch to side discharge mode ensures productivity, especially in grass too tall or thick to mulch effectively. Controlling clipping dispersion reduces cleanup time. 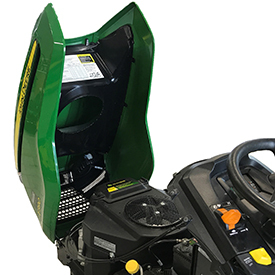 Each MulchControl attachment includes everything needed: baffles and mulch blades for all attachments, and the actuator, wiring, and switches for the electric one-touch attachments. 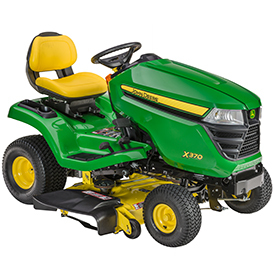 * NOTE: Model year 2016-2017 X300 and X500 Series Tractors (X300 serial number 10,001-50,000 and X500 serial number 110,001-130,000) require replacing the tractor wiring harness and dash panel to use an electric MulchControl attachment. A large, 14-in. (36-cm) diameter steering wheel is comfortable to use and minimizes steering effort. Full-length foot mats provide comfort for the operator and protect the footrest area. Seat travel of 7 in. (18 cm) with 15 positions allows the operator to be seated comfortably and easily operate the controls. Seat can be easily adjusted fore and aft by the operator while sitting on the seat. 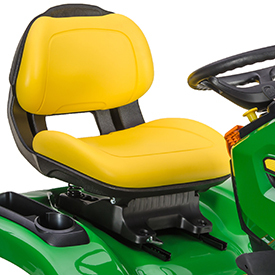 Open-back design allows air circulation to keep the operator's back cool and dry for a more comfortable ride. Grasp at the top of the seat is conveniently located for use when tilting the seat up to protect it from the weather. Springs are adjustable fore and aft to any of three positions. Tool tray is designed into the seat base. Can be used to store gloves, small tools, etc. The cup holder holds a variety of container sizes. Tool tray provides convenient storage. Cup holder and tool tray are constructed of durable acrylonitrile butadiene styrene (ABS) plastic. 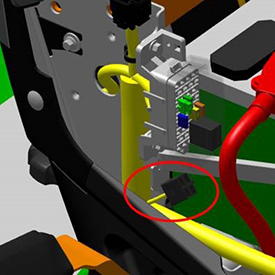 A removable plug on the console, in front of the operator, provides a convenient location for the optional 12-V outlet and makes installation easy. 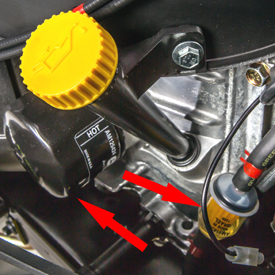 The four-cavity connector includes battery, ground, and key switch terminals and is turned on and off with the ignition switch. Controls are color coded and labeled with English words for easy identification by the operator. Controls are logically placed and easy to reach. 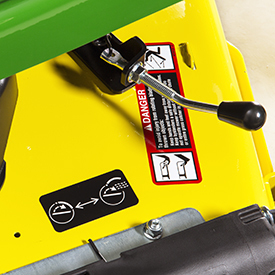 The power take-off (PTO) switch allows the operator to get fingers underneath it, like a T-handle, to pull up for easy activation. 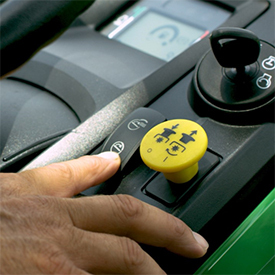 The reverse implement option (RIO) switch is a yellow button. 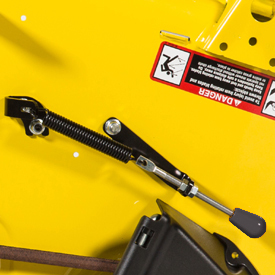 The latch control on foot-lift models and hydraulic-lift control on power-lift models and the park brake latch are pivot levers for low effort. Cruise control activation is handled by an automotive-style button. 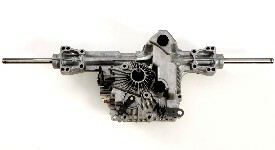 Separate engine speed and choke controls make starting and warming up the engine easier in cold weather. 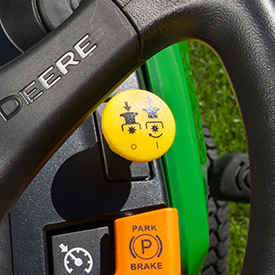 The choke lever is spring loaded to eliminate the chance the tractor will be unintentionally operated with the choke partially closed. Functional design of the throttle and choke controls provides good appearance and a comfortable feel. Display features dark-cockpit design to minimize operator distractions. Display is back lit for night visibility. Night visibility is especially useful with snow blower use. Hour meter makes it easy to tell when oil changes and other maintenance should be performed. Electronic fuel gauge provides real-time fuel level information. The X350R has a low fuel light, rather than a fuel gauge, to provide the operator with a noticeable warning when low on fuel. A tachometer graphically displays engine speed. 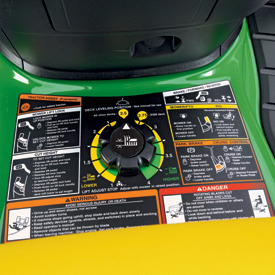 Target-zone graphics inform the operator of the engine speed range to use for best cut quality. 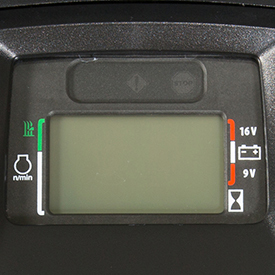 An indicator tells the operator when the PTO is operating. Bright caution and stop lights capture the operator's attention when important information is on the instrument cluster. Damage can be prevented and repair costs reduced by addressing problems early. 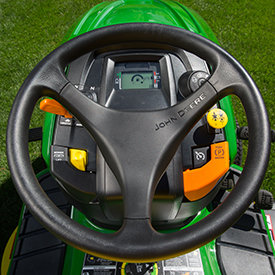 Operators are advised of what the problem is if they attempt to operate the mower with unsatisfied PTO, seat, or park brake interlocks. The indicators are also useful to identify the reasons the PTO or engine may have shut off when an interlock is unsatisfied. Operators are advised if battery voltage is low, normal, or excessive. 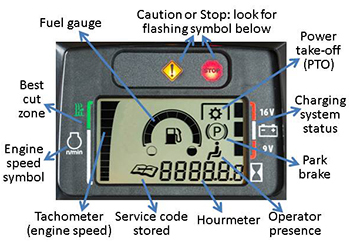 The service indicator light illuminates to indicate a diagnostic error code is stored. 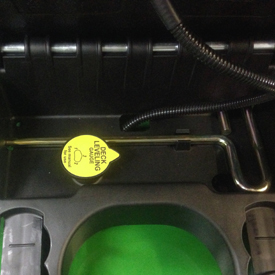 Onboard diagnostics provides trouble codes for use by trained technicians. For example, a technician will be able to test switch functionality and circuit continuity without tools. Automotive-type accelerator control ensures easy operation. Operator can change direction without lifting foot off the platform. Large pedal surface gives superior operator comfort. To engage, push the cruise-control button and hold until the foot is removed from the forward pedal. For emergency stop, the cruise control can be released by pushing on the brake pedal or the forward pedal. 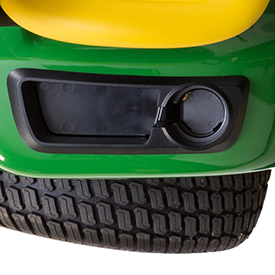 Exact Adjust ports on the fender deck allow for easy and accurate leveling of the mower deck for optimum mowing performance. 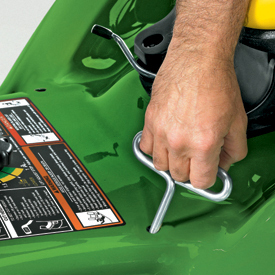 Deck-leveling gauge is placed at the appropriate location under the left rear, right rear, and front of the mower deck as the cut height is adjusted using the Exact Adjust tool and front draft arm adjusting nuts. The easy-to-use raised position lock operates similarly to the park brake lock. The foot pedal is out of the way and not likely to catch on bushes and tree limbs when mowing. 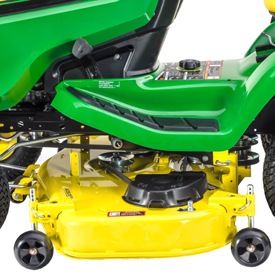 The mower deck returns to the same preset height each time it is lowered. 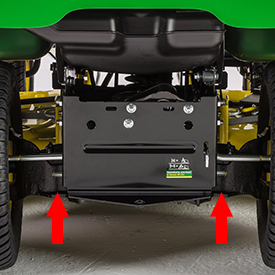 NOTE: The adjustable lift-assist spring is standard equipment on tractors with manual foot-lift system that are shipped with the 48-in. (122-cm) and 54-in. 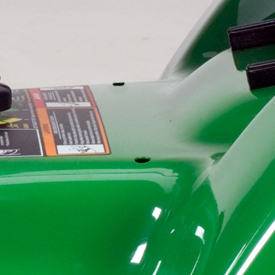 (137-cm) side-discharge mowers, and an option for tractors shipped with 42-in. 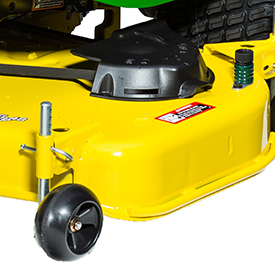 (107-cm) mowers. 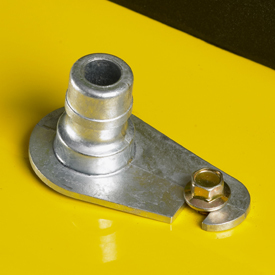 It is a recommended option for foot-lift tractors sold with the 42-in. (107-cm) mulch mower. 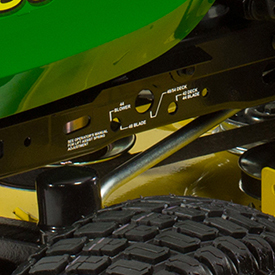 Lift-assist spring is provided on tractors shipped from the factory with a 48-in. (122-cm) or 54-in. 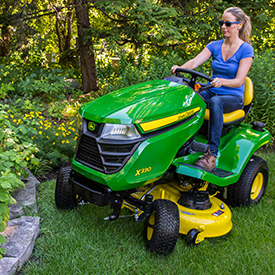 (137-cm) side-discharge mower deck, except models with hydraulic lift, and a recommended option for tractors equipped with a 42-in. (107-cm) mulch mower to minimize lift effort. 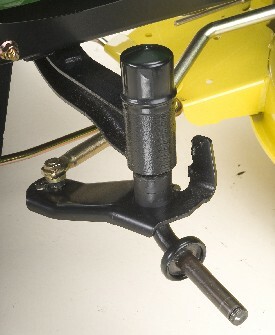 A spring-assist kit is available for other models for use with front equipment. 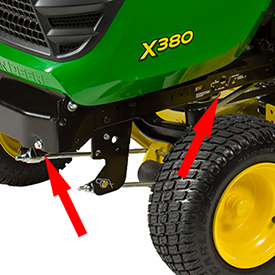 Lift effort can be easily adjusted by turning a bolt, located on the tractor front bumper, for optimum performance, depending on the equipment used (mower, front blade, snow blower, etc.). 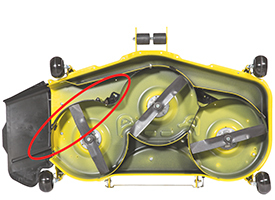 The mower will not be inadvertently locked in the raised position when mowing through ditches. 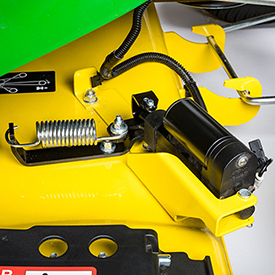 When installing or removing a mower or front equipment raised by the foot-lift system, spring tension may be removed from the connection points by pulling rearward on the lift pedal and raising the lift latch to hold the pedal in the rearward position. Depressing the brake pedal applies internal wet-disk brakes, which provide better reliability and longer life than external brakes, for safe stopping. The parking brake control is conveniently located for easy access. It holds the brake pedal securely in the locked position. 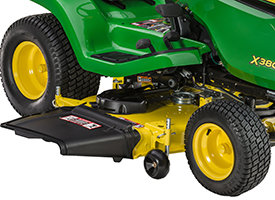 The heavy-duty electric PTO clutch is operated with a convenient dash-mounted switch. 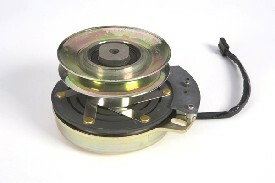 The PTO clutch is designed to operate through many on/off cycles. Carefully check the area around the machine. Disengage the mower before backing up. NOTE: Operating the mower while backing up is strongly discouraged. RIO should be used only when operating another attachment or when the operator deems it necessary to reposition the machine with the mower engaged. Stop forward travel. Allow attachment to run. Look down and behind the machine to be sure that there are no bystanders. Push and hold in the reverse implement switch while depressing the reverse pedal slightly. 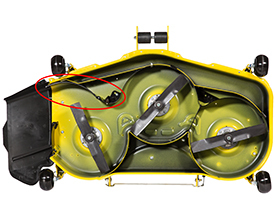 NOTE: If the attachment stops while positioning the machine, return mower engagement (PTO) switch to off position. Repeat this procedure from the beginning. Release the reverse implement switch and reposition the machine as the machine begins to move rearward. Resume forward travel. The attachment should continue operating. Repeat procedure to position the machine again. Important service points are located within easy reach. 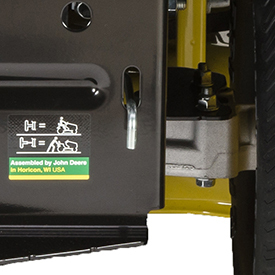 A service-interval decal is provided inside the tractor hood for convenience when servicing the tractor. 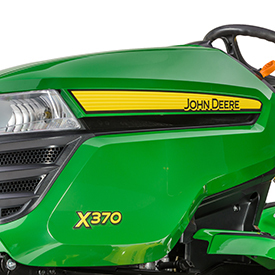 The high-quality engine used in the X300 Series does not require an 8-hour oil and filter change because improvements in the manufacturing process and quality of parts, components, and oils have eliminated the need for the short interval oil change requirement. The engine fuel and oil filters, the oil check/fill tube, and the oil drain tube are exposed for serviceability when the hood is opened. 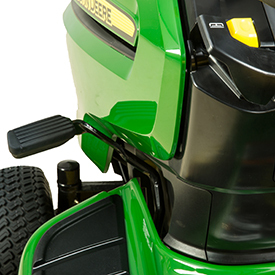 A mower deck must be level side-to-side and properly adjusted front-to-rear to give the best cutting performance. 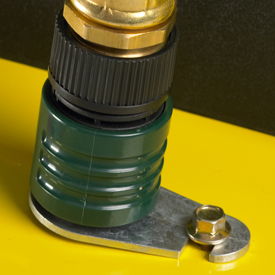 A removable onboard deck-leveling gauge and a hex-key tool are provided to make adjustment easy. They are securely stored under the tractor seat. Onboard deck-leveling gauge, Exact Adjust ports, and the hex tool work together. 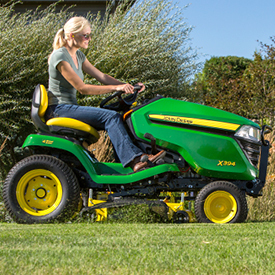 Exact Adjust simplifies leveling the mower deck if equipped with a Power Flow™ blower. 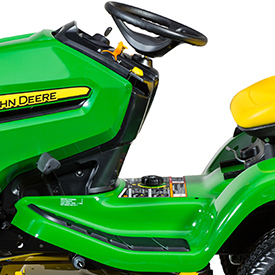 Keep a John Deere riding lawn mower running its best and know how it mows with the John Deere MowerPlus app. 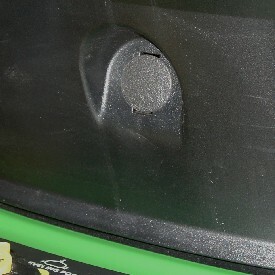 Simply scan the lawn tractor’s barcode to get custom information. 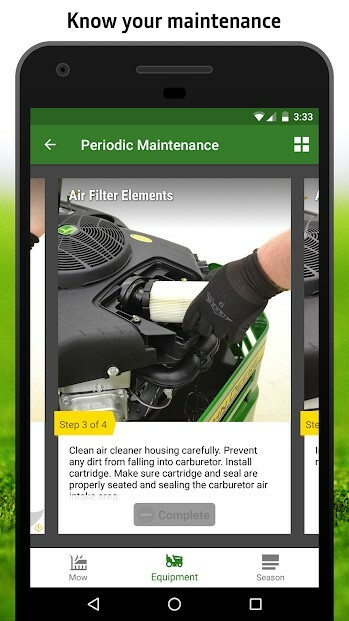 The app helps determine the best time to mow, communicates expert pre-mow tips, offers maintenance reminders, and provides walk-through guides. 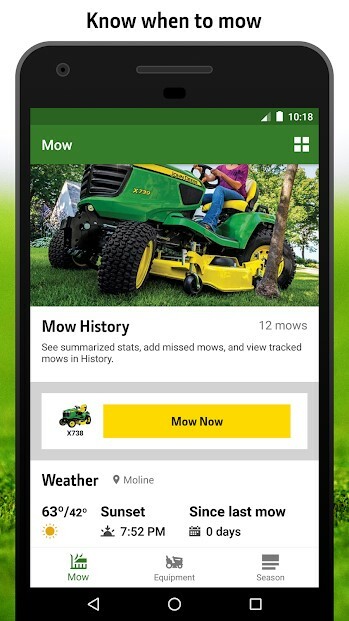 Look for the MowerPlus app on the mobile device’s app store. The app supports residential lawn equipment such as 100 Series, S240, X300, X500, X700, Z200 through Z600, and many similarly-sized older products. It does not presently support tractor models numbered 1000 and larger, such as 1025R. NOTE: Some product image variation may exist. 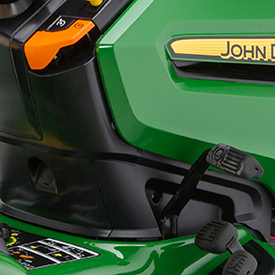 Also available is the John Deere MowerPlus smart connector (sold separately). 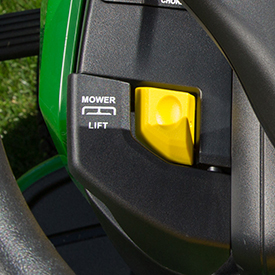 The John Deere MowerPlus smart connector wirelessly links a Select Series™ X300 or X500 Tractor to the MowerPlus app on a mobile device. 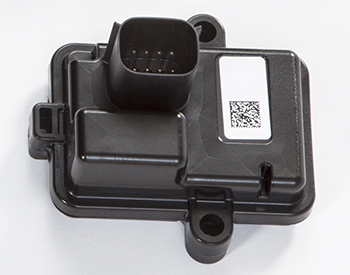 The smart connector transmits engine usage to the app, making it easy to track maintenance intervals. 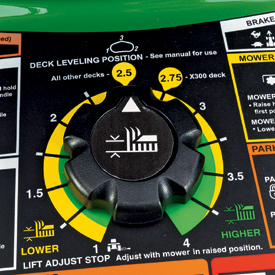 It also transmits the fuel level to the app—when thinking ahead about Saturday morning mowing, the operator can make sure the tractor is fueled and ready to go. 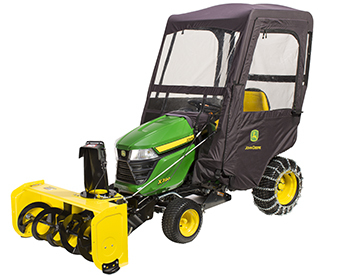 An advantage of lawn tractors is their ability to use equipment for snow removal. 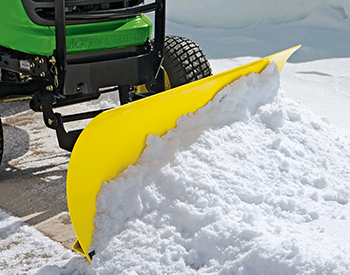 Lawn tractor owners can add a John Deere snow blower or front blade to make quick work of moving snow whenever the need arises. 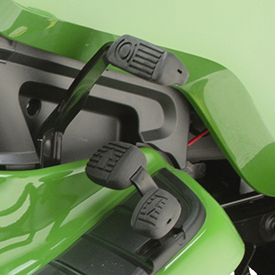 Weather enclosure and tire-chain attachments add comfort and performance. The Tuff Torq® hydrostatic transaxle encloses the hydrostatic pump and motor rotator groups in the same housing with the differential and axle housings. This design is very efficient and reduces the number of sealing surfaces to minimize the potential for leakage. Use of the latest valve designs has significantly reduced the sound level. Large pump and motor rotating groups ensure long life and efficient operation. 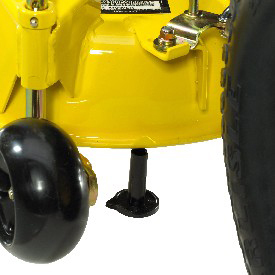 A freewheeling valve control is conveniently located near the tractor rear hitch plate for good visibility and easy operation. Kanzaki and Tuff Torq are trademarks of Kanzaki Kokyukoki Manufacturing Company. Two 27-W bulbs provide excellent lighting for good visibility during evening operation. A headlight position on the ignition switch makes it easy to operate the headlights. 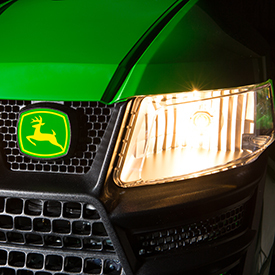 The headlights are designed to provide an optimum lighting pattern for mowing and snow removal.